Life on Earth reels under the Supercontinent cycles. Every Supercontinent forms with the collision and merger of all the plates causing a “tectonic pause”. Reduced seafloor spreading and albedo advances the ice sheets towards the equator. Massive ice sheets cover the ocean and whole or part of the Supercontinent causing a global ice age or snowball Earth event. Base of the continents further sinks into the mantle with the increased weight of the ice sheets. Increased pressure within the mantle forms as a superplume under the Supercontinent and eventually breaks the Supercontinental crust giving the new plates. Superplume with the increased seafloor spreading and the albedo causes a severe global warming and rapidly melts the ice sheets, exiting the global ice age. Rapid melting of the ice sheets floods the lowered continental regions. Isostacy gradually uplifts the submerged continental crust above the sea level. Each break in the crust causes a global warming and merger of plates causes an ice age. Mass extinctions occur in the ice age and global warming periods. Evolution takes place in the post global warming period. Ice ages and global warming forms the distinct boundaries in the sedimentary layers. The two major sources of heat supply onto the surface of Earth are solar radiation and the mid-ocean ridges. Variation in the incoming solar radiation or insolation initiates the dynamics of the ice sheet and the change in the seafloor spreading accelerates the movement. Extent of the ice sheets on the surface of the Earth defines the ice ages and global warming. Variation in the insolation due to the eccentricity of the Earth’s orbit is predominantly accepted cause for the 100,000-year period (1) ice age cycle (henceforth will be referred as cycle). Rate of seafloor spreading can change in the events of continental collision, ridge formation and ridge-trench collision. Advance and retreat of the ice sheets will be more or less same if the seafloor spreading is constant throughout the period of a single cycle. Reduction in the rate of seafloor spreading advances the ice sheets more than it retreats in a single cycle. Reduced seafloor spreading and the albedo together advances the ice sheets to more extent in multiple cycles. Increased rate of seafloor spreading retreats the ice sheets more than the advance in a single cycle. As a result glaciations will not be severe in the period of increased seafloor spreading. Rapid increase in the seafloor spreading combined with the albedo and green house effect causes a severe global warming and accelerates the retreat of ice sheets. Thawing period of the cycle also acts as an accelerator to the global warming and rapidly melts the ice sheets. Reduced seafloor spreading followed by a sudden increase in the rate of seafloor spreading is what the icehouse and hothouse scenarios happened in the geological past. Even though the sun plays a major role in controlling the climate, seafloor spreading and albedo acts as accelerators to that climate change and ultimately dictates the climate on the Earth. Continents collided and separated many times in the history of the Earth. Collision of the continents creates the folded mountains at the subduction zone and this mountain buildup slows the subduction process, ultimately stopping the subduction when all the forces acting at the subduction zone nullifies each other in a state of equilibrium. When all the subduction zones in the Supercontinent formation reaches the state of equilibrium, plates stops moving and closes all the ridges forming a single plate in a “tectonic pause”. Drastic reduction in the rate of seafloor spreading combined with the albedo effect advances the ice sheets towards the equator in multiple cycles. Reduced subduction also diminishes the activity of hydrothermal vents on the ocean floor. Eventually ocean freezes and ice sheets spreads on the Supercontinental crust forming a snowball Earth event (2). Removal of water from the oceans and depositing on the continental crust as the ice sheets drastically reduces the sea level and exposes the continental shelves. Continental collision and the uplift of the folded mountains reduces the total continental landmass and further reduces the sea level. Contracted denser sea water stops circulating in the oceans. Stagnated anoxic frozen ocean and the exposed continental shelves cause a major mass extinction of the marine life. The displaced mantle due to the gradual sinking of the Supercontinent may possibly uplift the oceanic crust. Reduced pressure on the oceanic crust due to the lower sea level may also help in uplifting the oceanic crust. Initially sea level decreases with the extending ice sheets and later may increase to some extent due to the uplift of the oceanic crust. In this period Supercontinent remains stationary on a single plate until it’s subsequent breakup and this “tectonic pause” could be very brief period. Plumes are the only vent for the dissipation of heat within the mantle and will be continuously active in the Supercontinental period. Probably more plumes form on the crust and eventually emerge onto the surface from the oceanic crust in the lowered sea level. Life in this Supercontinental period survives around these hotspots on the continental and oceanic crust. Ice free continental tropics also provide habitable environment for the species. In every global ice age or Supercontinental period all the life forms on different continents gathers on a single landmass. Species have to survive the encroaching ice sheets in smaller habitable areas and also have to safeguard themselves from the new predators joined from the other continents. Except in few low-latitude continental regions and around the hotspots, massive ice sheets covers the planet and makes the Supercontinent heavier. Even though more number of plumes continuously active in the Supercontinental period, they can’t compensate the total heat loss caused by the ridges. As a result pressure builds up in the mantle and forms as a superplume or intensifies an existing plume under the Supercontinental crust. Gradual subsidence of the uplifted oceanic crust may also increase the pressure within the mantle. Superplume heats the stationary and heavier Supercontinent and weakens the crust. Continuous buildup of pressure within the mantle eventually breaks the weak and heavier Supercontinental crust to evenly distribute the weight on the surface. At the same time oceanic and continental margin breaks to form the new trenches. This will be a violent and explosive period in the life of the Earth. Open ridge and the superplume spews the green house gases causing a severe global warming and also ejects massive amounts of magma onto the continental crust forming an extensive deposit of flood basalts (3). Global warming rapidly melts the ice sheets and increases the sea level. Newly created continental plates rapidly slide onto the oceanic crust with a trench migration. Increased seafloor spreading and albedo with the thawing period of the cycle further melts the ice sheets. Water seeps into the new ridges with the increased sea level and forms as the new shallow ocean basins. Increased sea level and the expansion of the water column floods the lowered continents. Oceans may even flood more extent of the continental regions with the uplifted old oceanic crust. Oceanic crust gradually subsidizes with the increased sea level. Plumes will diminish in intensity after the ridges were formed. Hotspots on the oceanic crust, a base for the survival of life in the Supercontinental period, submerges in the increased sea level. Continental flooding causes the erosion at the exposed interiors of the Supercontinental fragments and deposits the sediments at the shallow oceans. Chemical reactions result in a massive sedimentation of the banded iron formations and the cap carbonates (2). A new era begins in the sedimentary layers with the glacial and other deposits of the global glaciation. Massive erosion and the sedimentation reshapes the landscape on the surface of the Earth. Isostacy gradually uplifts the submerged continental regions over the sea level. Folded mountain chain may experience a massive uplift due to the imbalance of the forces with the breakup and sinking of the old slab. Gradual subsidence of the shallow ocean basins also reduces the sea level. Most of the survived species in the global ice age will face another mass extinction in the global warming and the subsequent flooding of the continental regions. Rapid overturn of the oceans disturbs the established ecosystems. Post Supercontinental period will have an explosion in the evolution of the surviving species. In the early history of the Earth, floating landmasses were freely moved on the hot molten surface of the Earth. They were freely colliding, merging and separating on the liquid surface. When the Earth started to cool, all the landmasses were coalesced together as a super landmass due to the gravitational pull and remained together while the Earth cooled further. Water vapor started to condense and formed the ocean on a thin crust around the super landmass. Earth might have been cold most of this later period. Intermittent volcanism and continuous bombardment of the comets might have repeatedly thawed the oceans. In this period either the super landmass might have quickly coalesced after breaking or might have moved around the globe without breaking apart. Further cooling of the Earth and the existence of ocean formed a thick and rigid oceanic crust. Diminishing volcanism frozen the ocean and spread the ice sheets to the super landmass by creating the first global ice age. Increased pressure within the mantle formed as a superplume under the super landmass, the first Supercontinent. Subsequent breakup of this first Supercontinent caused the exit of the global ice age and started the plate tectonics on the surface of Earth. Increase in the solar radiation shortened the later global ice ages and covered less area on the globe due to the increase in the landmass with the merger of island arcs. Ice sheet coverage may also depend upon the position of the Supercontinent on the Earth. If the Supercontinent forms around the equator it will have less coverage of ice sheets and on the poles more coverage. Icehouse and hothouse environments are the result of reduced seafloor spreading followed by a rapid increase in the seafloor spreading. Lower rate of seafloor spreading with the albedo effect advances the ice sheets to more extent in multiple cycles. Sea level continues to drop with the advance of the ice sheets. Maximum area of the continental slopes will get exposed at the glacial maximum and forms as a distinct boundary in the sedimentary layers. 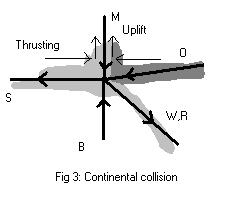 Ridge-trench collision, cessation of the ridge activity or a continental collision advances the ice sheets. State of equilibrium before the initiation of subduction also advances the ice sheets. If the rate of seafloor spreading reaches a minimum threshold point, albedo may cause a runaway global freeze of the oceans. Rate of minimum seafloor spreading required for the global freeze decreases with the increasing solar radiation. Reduced seafloor spreading might have frequently frozen the oceans within the earlier Supercontinent cycles due to the low solar radiation. Growth of the continental ice sheets reduces with the freezing of the oceans. Cracks in the icy ocean and the volcanoes feeds the continental ice sheets. Distribution of the ice sheets depends upon the elevation and the position of the continents on the globe. Plumes and the mid-ocean ridges feeds the oceans with iron and other minerals. Reduced seafloor spreading and the gradual subsidence of the extinct mid-ocean ridges builds the pressure within the mantle and forms the plume under the crust depending on where the crust is going to breakup. If subduction initiates at any of the trenches, plume forms under the subducting plate in the ocean otherwise the plume forms under the bigger and aged (intact for longer period) continental crust and breaks it giving the new plates. Fault systems may also yield to the plumes giving the new plates. Global warming caused by the plume and the new ridge thaws the icehouse environment. All the later ridge formations will not cause a severe global warming than the Supercontinental breakup due to the evenly distribution of weight with the dispersed continents and the continuous ridge activity on the crust. Speed of the Tectonic plates dynamically changes as they grow or shrink in size. The net rate of seafloor spreading depends upon the combined length of the ridges and the speed of the plates. Increase in the speed of the plates or formation of a new ridge rapidly increases the rate of seafloor spreading. Albedo and increased seafloor spreading with the thawing period of the cycle causes a global warming and melts the ice sheets. Raising sea level floods the continental regions and begins a new era with fresh sediments. Initially the increasing sea level floods more extent of the continental regions if the continent harbored ice sheets in the previous ice age. Later the rebound of the continent reduces the sea level to some extent. Gradual subsidence of the shallow oceans also reduces the sea level. Severity of the global warming depends on the speed and size of the new plates and the place of the break on the crust. Continental breakup will cause more severe global warming than the break in the oceanic crust. Open ridge and the plume spews the green house gases into the atmosphere and ejects massive amounts of magma causing extensive sedimentation of the volcanic origin. Global warming and the ice ages cause the mass extinctions depending upon the severity of the climate change. Whichever species adapts to the gradual climate change will survive and others face the extinction. Survived species continue to exist in the ice age period without much diversification. Rapid evolution takes place in the remaining species after the global warming period. There is a strong correlation between ice ages, global warming, sea level change, mass extinctions, plate tectonics and the sedimentary layers. Reduced seafloor spreading advances the ice sheets and lowers the sea level exposing the continental shelves. Increased seafloor spreading causes a global warming and increases the sea level with the retreat of the ice sheets. Continental flooding enables extensive sedimentation and the retreat of the oceans marks a distinct boundary in the sedimentary layers. All the major boundaries in the sedimentary layers are the breakup, collision or merger of different plates. Most of the mass extinctions happened at the boundaries of these sedimentary layers. Divisions within a major era could be the result of a change in the net rate of seafloor spreading due to either a change in the speed of a plate or a change in the ridge length without any breakup or collision or merger of the tectonic plates. These divisions could also be an unknown past activity in the crust. Along with the recording of magnetic direction in the rocks, these boundary periods should also be used in determining the past plate movements in the history of the Earth. Plate tectonics starts on the Earth with the breakup of a Supercontinent and ends with the formation of another Supercontinent. This Supercontinent cycle repeats on the Earth as long as there is enough heat in the core to drive the convection in the mantle. Following is a simple description of the plate tectonics in its different phases and the resultant dynamic change in the seafloor spreading. Changes in the insolation and the rate of seafloor spreading controls the climate on the Earth. Plate Tectonics can be described in terms of the Statics (study of the rigid body mechanics) as a resultant force of all the forces acting at a subduction point (SP). SP is any point on the line of subduction at the trench. Reduced seafloor spreading causes an ice age and increases the pressure within the mantle. Increased pressure forms as a plume under the continental crust. Subsequent uplift and breakup of the continental crust creates a new ridge. Continental margin also breaks and forms as a trench. At this newly created trench, oceanic plate submerges because of its higher density and the continental plate slides on to the lowered oceanic plate with an inclination. As shown in Fig. 1, only two forces will be acting at any of the subduction points. Force of the continental or overriding plate (O) acts toward the SP and the resistance of the crust or the buoyancy of the mantle (B) also acts toward the SP, in a perpendicular line to the curvature of the oceanic plate. 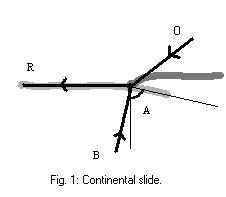 The resultant force (R) of the O and B acts towards the ocean and slides the continental plate on the oceanic plate. This moves the SP towards the ocean and increases the dipped portion of the oceanic plate under the continental plate. This ocean ward movement of the SP also called as the trench migration (4). In this period the oceanic plate remains stationary and the continental plate rapidly slides on the oceanic crust. Increased seafloor spreading and the plume causes a global warming in the beginning of the continental rifting. Younger and soft magma within the ridge splits in half at the center of the ridge while the plate is in motion. Ridge builds both the plates equally at about half the rate of trench migration, even if one plate is stationary at the ridge. This buildup of the plate makes the ridge appear like moving away from the stationary plate with a ridge migration. Initially the dip angle (A) of the subducted slab will be very high. The weight of the slab will be less compared to the buoyancy of the mantle on the slab and as a result the slab floats on the surface of the mantle. Ocean ward movement of the SP keeps the slab flat or parallel to the surface. As the slab increases in length acquires the weight and slowly sinks into the mantle, decreasing the dip angle. Interaction between the trench migration and the slab weight keeps the slab suspended in the mantle. While the continental plate continues to slide on the oceanic plate, the dipped part of the oceanic plate increases and bends at the SP. This change in the curvature at the SP shifts the B towards the ocean. Ocean ward movement of the B acts as a break to the continental slide and finally stops the continental movement when the two forces act opposite to each other, nullifying the resultant force in a state of equilibrium. Slowing continental slide reduces the seafloor spreading and advances the ice sheets. Buoyancy on the slab decreases with the decreasing dip angle and when the dip angle decreases further, the weight of the slab exceeds the buoyancy on it and as a result exerts the force away from the SP into the mantle. 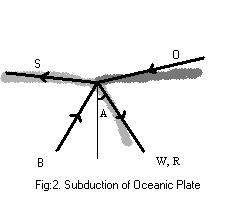 Subducting or the oceanic plate also exerts the force (S) away from the SP, towards the ocean, as shown in the Fig. 2. Dip angle decreases until the W exceeds the resultant force of all other forces (S, O, B) acting at the SP. Final resultant force R acts toward the W and moves the oceanic plate into the trench from the adjoining ridge. If still the equilibrium exists between all the forces at the maximum dip angle of the slab, subducting plate stretches at the weaker part of the crust. Plume forms under the crust and lifts the subducting plate forming an oceanic plateau. Further stretching of the oceanic plate breaks the crust and reduces the force of the oceanic plate. Equilibrium disturbs at the SP and the final resultant force, R acts toward the W and initiates the subduction by moving the new plate toward the trench. Increased seafloor spreading at the new ridge and the plume causes a global warming. While the oceanic plate is being subducted at the trench, the ridge associated with the oceanic plate also moves towards the trench. Force of the oceanic plate, S decreases as the ridge approaches the trench. W increases with the increasing length of the slab and as a result increases the rate of subduction at the trench. Pull of the oceanic plate under the continental plate exerts the force on the continental plate and lifts the continent at the SP. Subduction of the oceanic plate continues until the ridge joins with the trench creating a fault. Reduced seafloor spreading with the ridge-trench collision advances the ice sheets. All the subduction points having the same resultant force moves the oceanic plate uniformly. Difference in the resultant force causes the plate to move in different speeds. This causes the ridge to split creating different plates and moves them in different speeds towards the trench depending upon the local subduction rates. If there is another continent on the subducting plate, the two continents collides rising a folded mountain chain after the oceanic crust on the subducting plate was consumed. Thrusting of the continents uplifts part of the crust and forms as a folded mountain chain at the subduction zone. Weight of these mountains (M) acts towards the SP as shown in Fig3. As the weight increases, root of the mountains sink into the mantle. Pull of the slab also enables the root to sink further deep into the mantle. As the mountains sink into the mantle, buoyancy also increases on the crust and acts opposite to M and W towards the subduction zone. As the mountains build up, buoyancy also increases and slows the subduction process. Subduction process and the mountain buildup continue until all the forces acting at the SP reaches a state of equilibrium. At this point subduction of the lithosphere stops and ceases the mountain buildup. As a result both the continental plates merges together and forms as a single plate. Depending upon the relative motion of the surrounding plates and the final motion of the new plate, any of the adjoining ridges cease to exist on the ocean floor. Reduced rate of seafloor spreading advances the ice sheets causing an ice age. Eventually slab breaks and sinks into the mantle. Due to the imbalance of the forces, mountains may get further uplifted until the equilibrium is reached between the weight of the mountains and the buoyancy of the mantle. Ridges on the ocean floor continuously rearranges in different directions while the continents were heading towards the Supercontinent formation. When all the continents collide to form the Supercontinent, plates merge one after the other with the central plate. Magma within the ridges seals the boundaries and forms as a single plate causing the tectonic pause. Drastic reduction in the seafloor spreading advances the ice sheets and causes a global glaciation or snowball Earth event. Plate Tectonics creates a controlled environment for the dissipation of heat within the Earth. For the formation and survival of Plate Tectonics on a planet, it needs to have water or a cooling agent on its surface to cool and solidify the out coming magma at the ridges and huge lighter continental crust to get split into different plates. It also needs to have a convecting mantle to enable the subducted slab to sink through it. Mantle also drives the Supercontinent cycle by splitting the Supercontinental crust into different plates every time it forms with the merger of all the plates. Snowball Earth events can be recognized by the deposits of the anoxic ocean. Ice covered ocean cuts off the contact between the ocean and the atmosphere. As a result, all the ferrous and other elements emanating from the plumes and the ceasing ridges accumulate in the oceans. Global warming resulted in the Supercontinental breakup, reinitiates the contact between the ocean and the atmosphere. Chemical reactions between the ocean and atmosphere results in a massive deposit of the banded iron formations, cap carbonates and other similar deposits (2). Most of these deposits were formed in extensive shallow oceans of the continental fragments formed with the breakup of Supercontinents. Apart from the known two snowball Earth events, all other occurrences of these deposits fall under the apparent Supercontinent cycle. If the Supercontinent cycle (5) happens after every 425 million years (My) and the last Supercontinent broke apart around 250 million years ago (Ma) at the beginning of the Mesozoic era, the sequence of the previous Supercontinental breakup periods falls around 250, 675, 1100, 1525, 1950, 2375 and 2800 Ma. Extensive formation of folded mountain chains preceded almost every period in the sequence. Occurrence of anoxic ocean deposits in all of these Supercontinental periods is a strong indication of global glaciations in these periods. Glacial deposits are just one of the sediments of the snowball Earth event. Absence of these deposits should not prevent us from studying these periods with respect to the snowball Earth scenario. First Supercontinent: Sudden increase in 87Sr/86Sr ratio of marine carbonates around 2700 Ma may be the result of the initiation of contact between the continents and the oceans on the Earth. Banded iron formations (6,7) also indicate the presence of an anoxic ocean with a global ice age before this period. Because of the above reasons and more significantly this period falls under the Supercontinent cycle, there is a strong possibility that a Supercontinent existed around 2800 Ma. Plate Tectonics on the Earth might have started with the breakup of this first Supercontinent. Even the trace of earliest terrestrial ecosystems was found after this event (8). This proves that each Supercontinent harbored some kind of life forms and later they might have faced extinction in the formation and breakup of the next Supercontinent. Second Supercontinent: Paleoproterozoic Snowball Earth event (9) around 2400 Ma was formed on an Archaean Supercontinent. Global glaciation was preceded by a massive formation of the folded mountain chains. Banded iron formations and the cap carbonates were deposited on the shallow oceans of the continental fragments. Third Supercontinent: An extensive deposit of the banded iron formations and other similar deposits around 1900 Ma (6) is a clear indication of anoxic ocean formed by a global glaciation. A possible Supercontinent formation around this period is also a strong indication of snowball Earth event around this period. Fourth Supercontinent: Apparent Supercontinent formation and a peak in the banded iron formations around 1500 Ma (6) may be a result of global glaciation in this period. Fifth Supercontinent: There were some observations about the formation of Rhodinia around 1100 Ma. It means the previous Supercontinent existed at least 400 My before this period and that falls around 1500 Ma. Rhodinia started to breakup around 700 Ma coinciding with the Neoproterozoic snowball Earth event. A vast period of 800 My for the Supercontinent cycle is not conceivable with the present understanding of the plate tectonics. Existence of banded iron formations (6) and a possible Supercontinent formation around 1100 Ma is a strong indication for the existence of another Supercontinent in this period other than the Rhodinia. Sixth Supercontinent: Rhodinia was the sixth Supercontinent. Neoproterozoic global glaciation (10) started around 800 Ma on the Rhodinia Supercontinent and ended with the breakup of the Supercontinent around 700 Ma. The possibility of Rhodinia continuing from 1100 to 700 Ma without breaking apart is meager because Supercontinent can’t survive such a lengthy period of 400 My. A Supercontinent can’t sustain for longer period after it forms completely and also a maximum of 100 My is possible between the formation and breakup of the Supercontinent. Timing and the duration of the global ice age on Rhodinia signifies the formation of the Supercontinent around 800 Ma. On these grounds it is possible that the Rhodinia formed around 800 Ma and the observed Supercontinent formation around 1100 Ma should be a different Supercontinent. Immediate amalgamation of the continents as the Gondwanaland (11) after the breakup of the Rhodinia also caused a global glaciation with less severity. Seventh Supercontinent: Pangaea was the seventh Supercontinent. Ice age on the Gondwanaland when it was part of Pangaea around 270 Ma was the recent Supercontinental global ice age (12,13). Breakup of the Pangaea around 250 Ma thawed the environment with a global warming and started the Mesozoic era. Permian extinction started with the global ice age and culminated with the global warming of Supercontinental breakup. Eighth Supercontinent: Next Supercontinent forms in approximately another 175 My from now and the breakup of that Supercontinent will cause another mass extinction on the Earth of the type and scale of Permian extinction. Geochronology or Stratigraphy is the true history of plate tectonics on the Earth. Each boundary is a result of breakup or merger of the tectonic plates. It will be more meaningful if we name the eras with the concerned event in the crust of the Earth. A major era in the history of the Earth starts with the breakup of a Supercontinent and ends with the formation of another Supercontinent. Rhodinian era can be defined from the breakup of the Rhodinia to the formation of the Pangaea. This includes the present late Neoproterozoic and whole of the Paleozoic era until the end of the Permian period. Pangaean era starts with the Mesozoic era and continues through the present until the formation of the next Supercontinent. Breakup or merger of plates forms the smaller boundaries in between the two Supercontinental periods. In many cases ice ages were followed by hothouse environments. Boundaries tend to form with the regression of the ocean in the glacial maximum period. Subsequent transgression of the ocean in the hothouse environment begins another layer on the boundary. Sedimentary layers forms much like the tree ring development between the summer and winter periods of the year. Sedimentary layer begins with the global warming and ends with the ice age. The gap between the ice age and the next global warming is the boundary. Therefore the boundary may not be the exact period of the crust activity. Following is the comparison between the boundaries and the plate movements in the past from the breakup of the Pangaea to the present. Permian and Triassic boundary was formed around 250 Ma with the breakup of Pangaea. Permian mass extinction was started with the global glaciation and culminated with the global warming caused by the breakup of the Supercontinent. Siberian eruptions might be the result of a superplume that broke the Supercontinent. Triassic and Jurassic boundary around 205 Ma was the result of the breakup of North America and Europe from the rest of the Supercontinent. Another mass extinction was also observed in this period. Icehouse and hothouse scenario observed in this period is the result of the reduced seafloor spreading and the subsequent eruption of the superplume, which laid the extensive Central Atlantic Magmatic Province (CAMP). Jurassic and Cretaceous boundary around 135 Ma might have formed with the breakup of Australia form the Antarctica. The K-T, Cretaceous and Tertiary boundary around 65 Ma was formed when India separated from the Africa. Deccan traps were formed in this period with the upwelling of the Reunion plume. The subsequent global warming caused another mass extinction and culminated the extinction of the dinosaurs. Paleocene and Eocene boundary was formed around 57 Ma with the breakup of European plate from the North American plate. North Atlantic Magmatic Province was formed over the Iceland plume in this period. Tertiary and Quaternary boundary formed around 2 Ma coincides with the collision of Indian plate with the Eurasian plate. Reduced seafloor spreading with the uplift of the Himalayas caused the subsequent ice age. Breakup of the South America around 120 Ma over the Walvis hotspot and the breakup of Antarctica around 170 Ma and the related Karoo-Ferrar flood basalt volcanism can also be traced in the sedimentary layers. Apart from the above mentioned events, ridge-trench collision, cessation of ridge activity and the rifting of the oceanic crust also leaves a distinct mark in the sedimentary layers. Discrepancy between my observation and the data, if any exists, can be resolved with further exploration of the sedimentary layers and the paleomagnetism. Paleomagnetism only provides the latitudinal position of the plates and this may generate a false interpretation of the plate movements if they move horizontally to the equator. By combining the paleomagnetism and geochronology together in determining the plate movements we may get more precise history of plate tectonics. The discrepancy about the formation of Rhodinia may also be resolved with this new direction. The story of global deluge is part of almost every ancient culture. The description of the events appeared to be analogous with the breakup of the Supercontinental crust. Global deluge depicted in the ancient cultures is about the melting water of the global ice age and the subsequent flooding of the continental regions after the breakup of the Supercontinent. Loss of life is the mass extinction in the global warming caused by the breakup of the Supercontinent. Deep fountains (14) might be the superplumes formed under the Supercontinental crust. All the survived species were depicted as saved in the ark. More over the names attributed to the person who saved the species, phonetically resembles very closely in many cultures. Noah (Genesis) and Manu (Manusmrithi) are just two identities among the many references. The loss of life in the global deluge is a clear indication to the normal life in the world before the deluge. Ancient Indian Vedic scriptures depicted the global deluge as occurring seven times in the history of the Earth. They have even provided the names of seven different individuals who started the new life after each global deluge. According to the Manusmrithi, the first one is Swayambhuva Manu before him there was no life on the Earth. The other six are Svarokisha, Auttami, Tamasa, Raivata, Kakshusha and Vaivaswat each with the last name as Manu. Following is the duration of Manvantara cycle, a period between two consecutive Manus, as described in the ancient Indian Vedic texts (15,16). Each Manu period starts with a global deluge of 1,728,000 years and later lasts for another 306,720,000 years with normal life, totaling a period of 308,448,000 years for a single Manu period. Of these six Manu periods have been elapsed and we are in the 7th Manu period of which 27 chatur-yugas have been elapsed and the current running is 28th chatur-yuga. Within this chatur-yuga kritha, thretha and dwapara-yugas have been elapsed and we are currently in the kali-yuga. From the descriptions in many of the ancient Indian texts it has been deduced that the present kali-yuga had started on the year of 3102 BC. In India, the traditional calendars prepared on these ancient calculations still incrementing this kali-yuga period by one after every Yugaadi, a traditional New Year denoting the beginning of time or the start of the movement of stars. Ancient Indians gave a whopping period of 2 billion years as the present age of the Earth. And they kept incrementing this period every year from ancient times through the present and gave a maximum life span of 4 billion years for the Earth. According to the ancient texts, time started with the movement of the planets. They also mentioned that this event also coincided with the first global deluge on the Earth. Before this time it was dark all over the solar system. It means there was no perception of day and night before this period. Even though a big difference of 117 My exists between the Supercontinent cycle of 425 My and the Manvantara Cycle of approximately 308 My, there is no doubt that they both repeated six complete cycles and we are in the middle of the seventh cycle. Most of the ancient cultures also believe in the past six Earths and the present as the seventh Earth. From the formation around 4500 Ma until 2800 Ma Earth transformed from the liquid state to the solid state and later differentiated into layers. This period of the Earth’s history also witnessed the heavy bombardment of comets. We don’t even find the trace of plate tectonics in this period. More over the earliest terrestrial ecosystems were also traced after 2800 Ma. On these grounds the beginning of the first manvantara, the first Earth and the beginning of time can be identified with the breakup of the first Supercontinent around 2700-2800 Ma and the subsequent start of plate tectonics on Earth. The past six Manvantara cycles and the past six Earths are the past six Supercontinent cycles and the present Manvantara or the seventh Earth started with the breakup of the Pangaea around 250 Ma. Extensive erosion and the sedimentation that follows the Supercontinental breakup reshapes the landscape and appears like a new Earth. The perception of day and night happens with the rotation of the Earth in the existence of a luminous sun. Radioactive elements begin to decay as soon as they came to existence. Our modern perception of time started with the decay of the radioactive elements in the planetesimals, even before the sun and planets came to existence. Ancient civilizations perceived the time with the orderly movement of the planets around the glowing sun and also this event coincided with the breakup of the first Supercontinent. Ancient Indian texts not only provided a complete history of the Earth but also described the future. According to these ancient texts, the total life span of the Earth is about fourteen Manvantara cycle. That means at least another eight Supercontinents forms on the Earth before the final deluge. After the final Manu period, there will be another final deluge on the Earth. That gives fifteen deluges or Supercontinent formations and fourteen complete cycles. According to the ancient calculation that yields in a total life span of 4,320,000,000 years. According to the present calculations this period will be about 5950 My ( 14 x 425 ). About 2900 My elapsed from the breakup of the first Supercontinent and the Earth will be hospitable about the same period of time in the future. Interestingly the life span of the Earth also equals to 1000 chatur-yugas. This period has been described as the creation and the same amount of period from the collapse of the solar system to the orderly movement of another solar system, including its formation has been described as the destruction. Together the creation and the destruction, a period of 8,640,000,000-years (according to the present calculations this period will be 5950 + 5950 = 11,900 My = 12 Ga) has been repeating from unknown past. Widespread occurrence of the glacial deposits on different continents of the former Gondwanaland was one of the reasons behind the origination of the theory of continental drift (17). In reality the global glaciation itself formed when all the continents collided to form the Supercontinent. Snowball Earth event is a natural result of the plate tectonics and in fact is part of the Supercontinent cycle. This hypothesis proposes a Supercontinental tectonic pause and creates a unified view of this dynamic planet. Hypothesis combines the seafloor spreading with the solar radiation in explaining the global phenomena like the extensive global glaciation, global warming, sea level change, mass extinctions and the formation of sedimentary layers. This demonstrates the fact that all the physical phenomena on the Earth works as a system. This hypothesis even unified the ancient thoughts with science. Apart from unifying the physical phenomena, this hypothesis also opens new channels for further exploration. This hypothesis emphasizes the need to explore deep into many of the present concepts in modern science. Following are some of the other concepts that may need a critical review and further exploration in view of these new findings. Rate of seafloor spreading depends on the speed and number of tectonic plates. Supercontinental formation is a collision and merger of different plates. Island arcs also appear to merge with the Supercontinent before its breakup, ceasing the peripheral subduction. Merging of the old plates and the creation of new plates in the Supercontinental period is a clear indication of discontinuity in the plate tectonics. Even if any of the peripheral subduction continues; Supercontinental period will have minimum rate of seafloor spreading, far lower than the present rate due to the less number of tectonic plates. In any case, either the tectonic pause or minimum rate of seafloor spreading advances the ice sheets towards the equator causing a global glaciation. Possibility of tectonic pause or the minimum rate of seafloor spreading in the Supercontinental period is a clear indication of drastic changes in the rate of seafloor spreading. In this scenario the assumption of continuity in plate tectonics from its initial beginning in the early history of the earth appears to be falsified. Every body agrees to the fact of increasing sea level but there is no consensus on the cause of the global warming. Continuity in plate tectonics created a view that the seafloor spreading will be more or less same at any point of time. Due to this assumption seafloor spreading was excluded as a possible cause for the global warming. In view of this hypothesis the present observations of the global warming should be analyzed in respect to the rate of sea floor spreading. Ancient descriptions about the global deluge might have changed through the time from their original form due to repeated copying or rewriting of these texts. Originally these texts might have represented the ancient thoughts accumulated through generations of observation of the nature. We need to explore deep into these texts with a scientific view. All the ancient stories about the global deluge need to be studied in conjunction with the Supercontinent formation, global glaciation, tectonic pause, superplume, Supercontinent breakup, global warming, mass extinction and the subsequent flooding of the continental regions. Even though there were seven global deluges, only the recent global deluge occurred with the breakup of Pangaea was the most prevalent event among the ancient cultures. Ancient Hebrew texts described the seven Earths, each separated by a salty ocean and then a fresh ocean. The salty ocean was the water around the Supercontinent and the fresh ocean was the water from the melting ice sheets after the breakup of the Supercontinent. Environment on the first Earth was dark; it could be possible that the first Supercontinental period received very little radiation from the sun. Stars and constellations were appeared brighter and bigger on the second Earth. It is possible that the universe might have been closer around 2400 Ma. Expansion of the universe distanced the stars away from each other. Sixth Earth was dry and its period was from the breakup of Rhodinia to the formation of the Pangaea. Gondwanaland formed in the early period of this era and its vast expanse might have had extensive dry land in the interior of the continent. Seventh Earth was started with the breakup of the Pangaea and continuing through the present. The question here is how the ancient civilization in the remote past was so advanced in determining the cyclic nature of the Earth. To derive such an extensive system of cycles, it requires lot of observation and collection of data for generations. Later the data needs to be analyzed to arrive at a common principle. Every ancient author mentioned numerous earlier references and nobody claimed that the cycle was their own discovery. Present concepts in the history and evolutionary biology claims that humans evolved through the time and attained the present position. In this case how the present science explain the advanced state of human being in the remote past? How many years it would have been taken to arrive at that advanced state? If the humans acquired the knowledge about the global deluge then why they need to fear about it and weave a story of Ark to save the species from the deluge? If the knowledge was not acquired then the human race indeed might have witnessed the global flood. In that case, when the human race first started on the Earth? Rotation of the planet around its axis gives the perception of day and night. And the revolution of the planet around the sun starts the beginning of a year. The perception of time is just limited to the solar system. Our perception of time in this solar system might have started with the glow of the Sun and the movement of the planets. Radioactive elements begin to decay as soon as they form at the beginning of the solar system. It would have been taken much longer period from the formation of these early elements to the orderly movement of the planets around the glowing sun. Ancient Indian texts certainly didn’t include the time taken for the formation of the Earth. This ancient Indian event of beginning of time coincides with the breakup of the first Supercontinent. Changes in the rotation and revolution might have also played a role along with the internal pressure in breaking the crust. According to the modern calculations, the sun is increasing it’s radiation by 1% of the present radiation in every 100 My. In the 4500 My history of the solar system, the total change accounts for only 45% of the solar radiation. In this case the sun should have turned on with at least 55% of the present radiation. If the sun gradually attained the present radiation, then some significant change might have happened in the luminosity of the sun around the time of the breakup of the first Supercontinent and that might have resulted in the perception of time within the solar system. Note: In the 1920s, Milutin Milankovitch revised an earlier idea of variation in the eccentricity of Earth’s orbit as a cause for the ice age cycle and the same is known as the Milankovitch cycles. Hoffman P. F., Schrag D. P., Snowball Earth, Scientific American, 282, 1 (January 2000), p68-75. Note: In 1964, W. B. Harland proposed the concept of global glaciation. Later in 1992, J. L. Kirschvink extended the concept and termed it as a snowball Earth event. White R. S., McKenzie D. P., Volcanism at Rifts, Scientific American, 261, 1 (July 1989), p62-71. Zhong S., Gurnis M., Dynamic interaction between tectonic plates, subducting slabs and the mantle, Earth Interactions, 1, 1-003. [Available online at http://EarthInteractions.org/]. Nance R. D., Worsley T. R., Moody J. B., The Supercontinent Cycle, Scientific American, 259, 1 (July 1988), p72-79. Note: In the 1970s, J. Tuzo Wilson proposed that the continents disperse and then reassemble with the periodic opening and closing of the oceans after every 400-500 My. Later research placed the periodicity of the Supercontinent or Wilson cycle around 425 My. Condie K. C., Des Marais D. J., Abbott D., Geologic evidence for a mantle superplume event at 1.9 Ga, Geochemistry, Geophysics, Geosystems, 1, 2000GC000095. [Available online at http://146.201.254.53/%5D. Note: In the initial version of the hypothesis and in the newsgroup discussion, I have predicted three more global ice ages to be around 1100, 1525 and 1950 Ma. This paper supports my prediction and provides the data for the Supercontinent formed around 1900 Ma. This paper also provides the data for the other two events but further exploration may isolate these events more clearly. Zimmer C., Ancient Continent opens Window on the Early Earth, Science, 286, p2254-2256. Watanabe Yumiko, Jacques E. J., Martini Hiroshi Ohmoto, Geochemical evidence for terrestrial ecosystems 2.6 billion years ago, Nature, 408, p574-578. Evans D. A., Beukes N. J., Kirschvink J. L., Low-latitude glaciation in the Paleoproterozoic, Nature, 386, p262-266. Hoffman P. F., Kaufman A. J., Halverson G. P., Schrag D. P., A Neoproterozoic Snowball Earth, Science, 281, p1342-1346. Hoffman P. F., Did the Breakout of Laurentia Turn Gondwanaland Inside-Out?, Science, 252, p1409-1412. Knoll A. H., Bambach R. K., Canfield D. E., Grotzinger J. P., Comparative Earth History and late Permian Mass Extinction, Science, 273, p452-457. Erwin D. H., The Mother of Mass Extinctions, Scientific American, 275, 1 (July 1996), p72-78. Note: In 1915, Alfred L. Wegener proposed the theory of continental drift on the basis of the matching continental shelves and the occurrence of widespread glaciation on different continents. Wegener assumed that the glaciation occurred when all the continents were together. Note: In most cases I have just used the data from the above references and the interpretation of that data is of my own opinion. Note: This is a modified version of my hypothesis first published on my home page on 1st August, 2000. I have modified my hypothesis by adding additional proof and incorporated the Milankovitch cycles for the initiation of ice ages. And also provided an analogy between my hypothesis and the global deluge of the ancient cultures. Check the home page for the summary of the earlier discussion and other relevant pages of my hypothesis. Note: This article is a copy of my Geocities page initially posted at http://www.geocities.com/karunakarm/unifiedtheory.html on March 11, 2001. The theory presented in this article was discussed extensively in the news groups. This article and all other links referring to the geocities site are presently available at http://kmarasakatla.org/earth/unifiedtheory.html after the closure of geocities site. This is one of the article initially planned to post on the arxiv server. The request for access was denied due to the reason that I had an hotmail email account. At that time endorsement policy was not started. Later, the same theory proposed in this article was appeared in journal Science (January 4th, 2008) as “Intermittent Plate Tectonics?” by Paul G. Silver and Mark D. Behn. Most of the work presented in this article almost a decade ago appears to be now a mainstream science.